Thank you for your interest in the Skinner North chess team. Our team is open to all Skinner North students who want to compete in tournament chess. 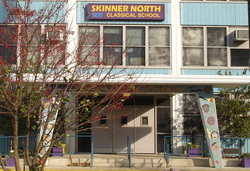 The Skinner North chess team is a well-respected competitor in the Chicago scholastic chess world. This co-ed team has helped develop long-lasting friendships and a competitive spirit rooted in sportsmanship and commitment to improvement. We definitely do not expect anyone to attend all tournaments. We do expect each chess team member to play in at least five tournaments during the year. Chess team, chess club...what's the difference? Our chess team is organized to compete in scholastic K-8 chess tournaments. We certainly believe in having fun and in looking to improve our chess playing while we compete. We function as a team and we take pride in our team's successes. We are committed to attend tournaments and to work on our skills between tournaments to help our team. Our team is open to all Skinner North students. Like any other team, there is a commitment to practice and to compete expected of those who join the team. A chess club places less emphasis on competition and more on socializing among club members. For example, there is a grown-ups chess club in Lincoln Square that meets once a week at a Thai restaurant for an evening of food, socializing and chess. Anyone is welcome to drop in whenever the chess club meets with no commitment or expectation to ever come back again. Skinner North does not have a chess club. We are a chess team. Working on our chess games and getting ready for our tournaments are important parts of being on the Skinner North Chess Team. We recommend our Wednesday workshops to help our players improve. They are also a nice team social activity. We heard your feedback that there was room for improvement in these workshops. This year the Wednesday workshops will be led by Chess-Ed. They will be held after school Wednesdays from 3:30 to 5:00. From 3:30 to 3:45 your child will be in the cafeteria and he or she will have time for socializing and a snack. Ms. Cox will collect the chess team and bring them to the Wednesday workshop at 3:45. Your child will have chess play from 3:45 to 4:00. From 4:00 to 5:00 Chess-Ed will lead differentiated chess lessons appropriate to each child's skill level. We realize our families need to think about their entire family schedule. If the Wednesday workshops don't work for your family, we can definitely consider other ways for your child to work on chess. These workshops are for the chess team only. There are other after-school activities available for those children who are not yet ready to join the chess team. For instance, J@School offers a beginner introduction to chess class at Skinner North and Chess-Ed offers beginner instruction elsewhere. This year, you must sign up for the Wednesday workshops if your child is going to attend them. To sign up, please follow the link Wednesday workshop sign-up. Sign up by September 10th to ensure the lowest possible price.